Bruins finish season in 4th place nationally! After a very competitive tournament, having faced three teams that finished in the Top Ten, UCLA ended up in fourth place. 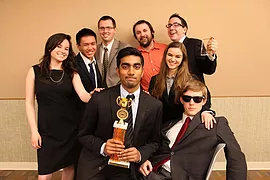 This was the last tournament for seniors John Accardo, Kyle DeCamp, Erin Engelmann, and Gokul Veedu. For the 17th year in a row UCLA qualifies a team to nationals. 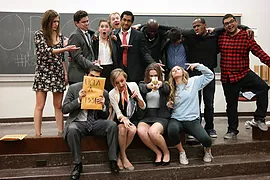 UCLA A not only secured a bid out of the Santa Monica ORCS, but they also won Spirit of AMTA. 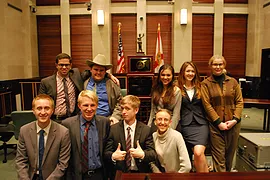 Spirit of AMTA is awarded to the team who demonstrates the values of the American Mock Trial Association and is voted on by the teams competing in the tournament. 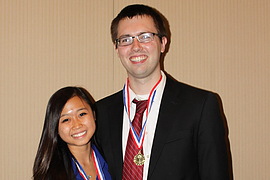 Additionally Kyle DeCamp and Chloe Connolly secured All-National Attorney and Witness awards respectively. Fitting in with the cross-town rivalry, UCLA sent 3 teams to USC’s tournament. UCLA walked away with 1st, 2nd, and 3rd place! UCLA C secured first with 7.5 wins, UCLA B secured second with 7 wins, and UCLA A secured third with 6 wins. UCLA’s A team takes first place, making it the first UCLA UCLASSIC win in 9 years. In fact, we have won more national championships (4) than UCLASSIC tournaments (3). Over the years, UCLA A placed top 5 every single year with UCLA B and UCLA C occasionally joining them. UCLA places at the most prestigous fall tournament. 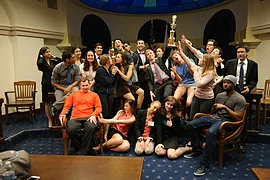 The Great American Mock Trial Invitational is hosted by UVA every year and UCLA in the past few years hasn’t been able to secure a trophy until this year. 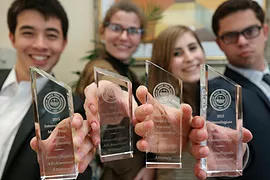 Seth Wacks, Callie Davidson, Madeline Yzurdiaga and Kyle DeCamp all secure All-American trophies at Nationals, keeping up UCLA’s streak of winning an All-American every year since 1999. With these 4 new glass trophies UCLA reaches 50 All-American awards. 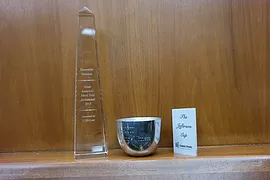 Our record is unrivaled in receiving the top individual award given outstanding witnesses and attorneys in AMTA. UCLA sends two teams to Nationals! For the first time in years, UCLA sends two teams to the National Championship tournament out of the tough San Diego Open Round Championship Series. UCLA A and B will both be representing the Bruins in Cincinnati, Ohio this year. 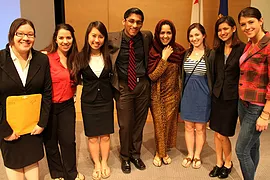 On April 13, 2014, UCLA’s Team 965 (pictured) faced Princeton University in Orlando, Florida to compete for AMTA’s 30th National Championship Title. Princeton entered the round having won the most ballots in AMTA history. After a round scored by prominent legal professionals, UCLA was able to turn out the victor. This marks the 4th National Championship won by UCLA, and remains the only program on the West Coast to hold a National Championship title. 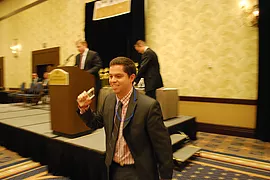 Proving once again that underclassmen can hold their own against more experienced competitors, sophomore Kyle DeCamp (pictured) wins his first ever All-American Attorney Award. 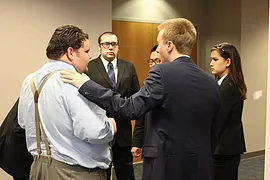 Winning 23/30 ranks on the prosecution, Kyle’s sympathetic opening won the favor of the judges, despite going up against Championship-winning programs. Kyle becomes one of 46 All-American award-winners in the history of UCLA. After facing off against the nation’s most dominant programs in the country’s most competitive tournament, NYU’s Downtown Invitational Classic, UCLA ended up as the most rewarded team in field. 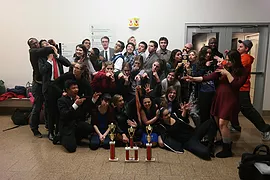 The Bruins returned to Westwood with a 4th Place trophy, an Outstanding Attorney Award for Kyle DeCamp, Outstanding Witness Awards for Tim Hooyenga and Philip Raucci, and best sportsmanship award as voted by the teams in attendance. The Bruins went down to San Diego to compete at the Annual Triton Invitational where two members, Tiffany Phon (pictured, left) and Tyler Jones (right) walked away with awards for perfect ranks. Despite facing tough competition, the team ended the tournament with an overall record of 2-2. 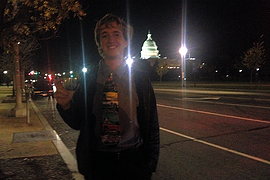 At the most prestigious tournament in the fall quarter, the Great American Mock Trial Invitational (GAMTI), junior Philip Raucci (pictured) was the highest ranked witness in the tournament as voted by the judges (especially impressive given the four-judge panels). The Bruins finished the tournament with a 7-9 record after facing Harvard, Duke, Columbia and NYU. In the first tournament of the 2013-2014 season, UCLA sent two teams to the Classic City Invitational in Atlanta, hosted by the University of Georgia. After facing top caliber opponents, including Harvard University and the defending National Champions Florida State University, UCLA wound up with a Top Ten finish. 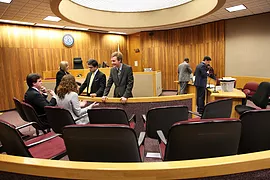 Seniors Tim Hooyenga and Iain Lampert (pictured, foreground) earned Outstanding Witness and Attorney awards, respectively, each with 18 ranks on the prosecution side. 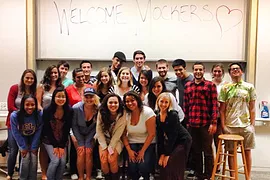 Samantha Abraham, Zell Agbaosi, Gabriel Anaya, Ammad Bajwa, Anna Diep, Erin Engelmann, Alicia Frison, Lauren Harris, Angela Hill, Austin Kaidi, Lena Kettering, Caroline Leahy, Alexander Lyons, Olivia McCoy, Eli Mordecai, Karen Rocha, Karina Salazar, Adrineh Shakelian, Elsie Soderberg, William Stringer, Alan Tokashiki, Seth Wacks, and Madeline Yzurdiaga. It’s about time! After years of using an out-dated and non-updated site, we are proud to launch this new website for the start of the 2013-2014 season. 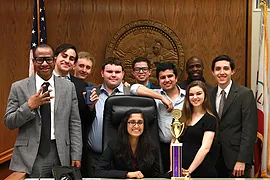 After four hard-fought rounds against UC Berkeley, University of Chicago, NYU and UC Irvine, UCLA finished with a record of 8-2-2, en route to a second-place finish in the Napolitano Division. The Bruins were one-half ballot away from winning division, finishing behind Florida State University, who won the National Championship. 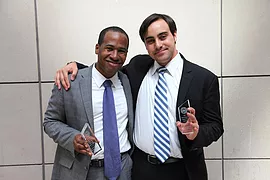 Seniors James Caress and Brandon Hughes earned All-American honors at the 29th National Championship Tournament in Washington, D.C. Caress, whose 29/30 ranks as an attorney was the highest in the nation, wins his first All-American award. Hughes, with 25/30 ranks, earned his second consecutive All-American witness award. With a record of 7-1, UCLA’s Team 964 was one of six teams at the Newport Beach Opening Round Championship Series Tournament to earn a berth to the National Championship Tournament in Washington, D.C. Team 965, at 4-3-1, finished in 7th place, just one-half ballot from also earning a bid. Seniors James Caress and Amanda Mundell, as well as junior Connor Winn, each earned Outstanding Attorney awards. With a composite record of 27-11-2, UCLA qualified four teams to advance to the post-season, the most of any program in the country. 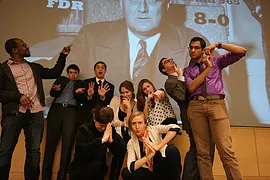 Unfortunately, due to AMTA rules, which prohibit more than two teams per program advancing, Teams 966 and 968 (pictured) cannot compete at the next stage. 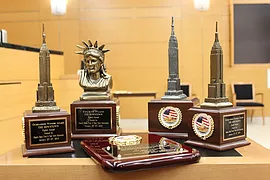 The Bruins won a total of six Outstanding Attorney Awards (Iain Lampert, Daniel Lutz, Philip Mayer, Amanda Mundell, Sara Turk, and Connor Winn) and four Outstanding Witness Awards (Brandon Hughes, Iain Lampert, Natasha Laraway, and Tiffany Phon). With a record of 6-2, UCLA’s Team 966 won the Rebel-Trojan All-In Tournament, which is hosted by USC. This victory marks the first tournament win by the Bruins for the 2012-2013 season. UCLA’s other team competing, Team 965, tied for the tournament’s best record, but ended up finishing in third place after tiebreakers were settled.